Posted on July 8, 2018 by Margaret & filed under Inspiration, New York Stories. A young father holds a little boy on his lap. The boy’s arms are wrapped around his dad’s neck, the smooth skin of his face nuzzled against a stubbly cheek. In one hand, he holds a neon green car. The scab on his knee suggests there may have been tears a few days back. Now, they’re long forgotten. The boy throws his head back and giggles with glee. The dad’s grin and twinkling eyes reflect the same emotion. Then they both turn, staring at something in the distance. 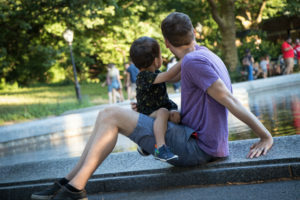 Though only the backs of their heads are visible at this point, they are tilted toward each other—man and boy still connected in the moment. We are at Conservatory Water in Central Park watching model sailboats glide by. It’s a gorgeous summer day—sunny skies, puffy white clouds, a cool breeze. Sipping cappuccinos, we observe our surroundings, though my husband’s view comes via his new toy—a camera I gave him for Christmas. After a few moments, he pushes the camera in my direction to show me the display. He has captured the father and son at play in a series of shots. Since his renewed passion for photography, we have talked about the ethics of street photography. Two new friends in the neighborhood we moved to last year are professional photographers. They’ve shared their wisdom and experiences. Sometimes, I still feel conflicted, especially when I see prints of people hanging on a wall in an exhibit or restaurant. Maybe it’s different now that people in this selfie era post photos of themselves everywhere. But I’m not sure I’d be comfortable coming face-to-face with myself while eating in a restaurant. The father and son are oblivious to everything around them. They’re laughing, staring into each other’s eyes with joy, and hugging. It’s a beautiful scene. When my husband shows me the photos, I am deeply moved. We each have a grown son from a previous relationship. We’ve experienced moments like this. But these are spontaneous, unposed shots you could never get of yourself with your child. An image comes to mind—the boy-turned-man one day looking at these photos, stunned by the powerful love his dad obviously feels for him. I suggest that my husband offer the photos to the man. He isn’t sure. I understand. Would the man feel we intruded on their moment? Would he find it creepy? Nevertheless, as the man and his son slowly walk away, my heart beats a tad faster and my leg jiggles up and down. I can’t let them disappear without a souvenir of their special day in the park. After clearing it with my husband, I hurry after them, a bit nervous about what the man’s reaction will be. I tell him he and his son brought back fond memories of our own children. I hesitate before telling him my husband has captured some beautiful photos, and if he would like them, he can contact us. As I hold out my husband’s business card, I wait for him to demand we delete the photos. Instead, he takes the card and thanks me. Before we’ve left the park, he has already emailed us. Later that night, my husband enhances and sends the photos, mentioning that while some of them aren’t perfect in a photographic sense, he is still sending all of them because they capture their emotions so well. Exactly what I thought as we sat on a bench pondering what to do. I admit I got a bit teary-eyed by his response. I still haven’t decided where I fall in the street photography ethics debate, but I’m glad this story has a happy ending. What a beautiful story!! And photo! !